"If HRH Prog / Sc-fi Weekender proves anything it is that the people make the event, everything else is just icing on the cake...."
Well, what a cracking weekend! Two festivals for the price of one; some great bands old and new; a wonderful location, otherworldly happenings; plenty of silliness with enough life-affirming moments to give everything an edge, and your own comfy bed and bathroom. Does life get any better? Following last year’s great event which took some beating (read the FFA HRH Prog / Sci-fi Weekender 2015 Review), it’s fair to say that 2016 pushed the event up a further notch. It’s no wonder the weekend is an early sell-out and that many festival goers book for the following year’s bash the moment they arrive. This reviewer simply loves the whole concept of out of season indoor festival weekends. It really is the best of all possible worlds. Events like Haven Hafan y Mor Holiday Park weekends offer all the best bits of the festival and gig scene without many of the hassles. It is difficult to overestimate the positive impact of your own accommodation and facilities after a wet summer under canvas. Not only that but the site attractions, entertainment spaces, and auditoria are pretty much the bee’s knees too. Without getting too evangelical, if you are still to take the plunge into the indoor music weekend scene then FFA can heartily recommend it. When the accommodation and facilities are factored in, many music / event weekends cost less than some mainstream summer festivals. Rock cabaret and clean sheets are a heady combination and the HRH Prog / Sci-fi Weekender is a fine place to start the journey. 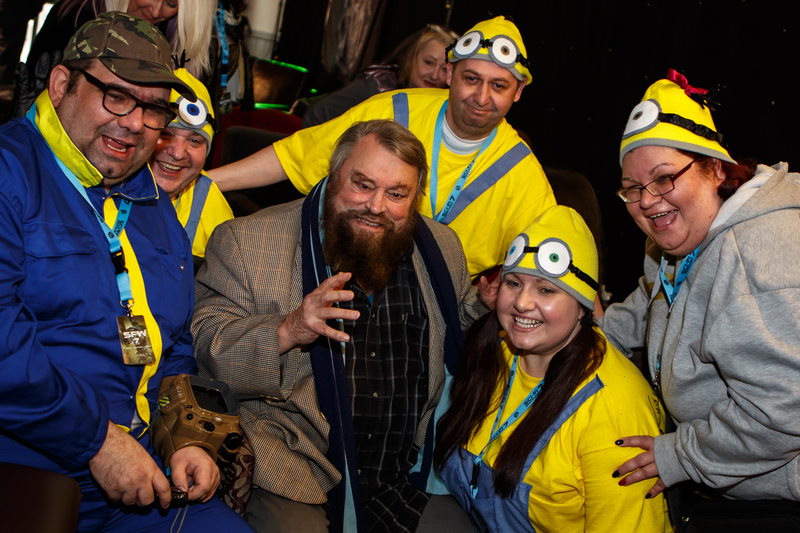 The outstanding event in Sci-fi world was Saturday’s malarkey in the Main Void featuring an audience with the legendary Brian Blessed. Somewhat larger than life in every aspect, Blessed was simply magnificent. Leaving the eminently capable MC Professor Elemental floundering in his wake, Blessed regaled the packed crowd with a roller coaster free form ride featuring stories of daring-do, luvvie tall tales, and a positive life philosophy that made you proud to walk the same planet as the man. It also helps that Blessed is as mad as a hatter and could not give a shite of course! At the age of 79 convention or compliance is hardly high on his agenda. Sharp as a pin, Blessed expounded a world view decanted down to Always Seize The Moment and maximise every single minute. Then he’d hit you with a tale or two to illustrate the point. Funny, wise, and hugely entertaining – it was a life affirming hour on every level. Splendid. Now Is The Happiest Time Of Your Life indeed. Over in Prog land the festival featured some of the true greats of the genre; established elder statesmen who, my oh my, can still cut the mustard, plus some young bucks who are surely destined to create a similar heritage. Arthur Brown really kick-started the opening night for FFA and delivered one of the sets of the whole weekend. 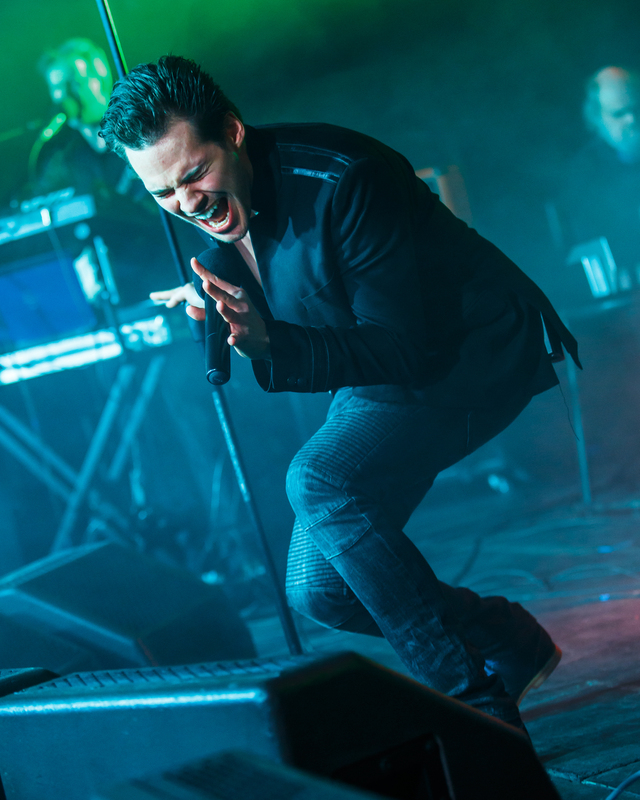 Always the showman, Brown graced the stage with a fair old audio-visual treat involving flamenco dancers, multiple costume changes, and an electric light suit which probably drained the National Grid. Importantly, the man’s voice is as pure, sharp, and powerful as back in his TOTP days. Kingdom Come classics aplenty with Time Captives probably the best of an excellent bunch. Throw in a calypso version of Simon Dupree’s Kites and all was well with the world. Excellent. Friday was crammed packed with goodies – and a few surprises. The unplugged sessions in the Owners Bar are always a treat and a great set from Abel Ganz illustrated the point. Close up and personal, this was a fine acoustic set from extremely capable musicians. The Fierce and The Dead rocked the main stage with a great set before Edgar Broughton blew us away. Broughton, playing a solo acoustic performance, was excellent. Thoughtful, powerful lyrics thrashing at a cruel world, the man sang of love and loss and raged against the sky at the unfairness of it all. Spine chilling in parts. Wonderful stuff. Blimey. Sonja Kristina was my youthful dream. Devastated that Curved Air were late cancellations. Fickle as ever – my new love is last minute substitutes Purson. New to this reviewer but what an absolutely awesome band. Psy Rock, Psychedelica, Prog, Rock & Roll, the labels don’t matter, the music is the thing and this crew are surely destined for bigger things. They already look and sound the part. They rock up looking like characters from Yellow Submarine morphed into some Andy Warhol flick and are musically excellent. Rosalie Cunningham is a show-stopping front woman and musician but her cohorts are pretty much flawless too. To badge them as one of the top sets of the weekend in such esteemed HRH Prog company is a compliment indeed. Catch ‘em now before stardom whisks them away. From young Bucks to, err, old bucks. Caravan, playing together for nigh on half a century, arguably delivered THE set of the festival for this reviewer. With a mammoth back catalogue this was a fabulous musical journey down memory lane. Tight as a nut and a seemingly effortless performance from genuine old stagers they delivered classic after classic. Encore Golf Girl simply topped it all off. Wonderful. Soft Machine did the business to close the stage. With the excellent Theo Travis leading the line, the band ran through the full gambit of the Jazz Rock genre. If there was a minor niggle it was more related to scheduling rather than musicianship. Not too sure a purely instrumental jazz fuelled band were the ideal closers to a buzzing Friday night but entertaining nonetheless. A busy Saturday illustrated the old and the new once again. Twinscapes turned our heads with some excellent twin bass guitar ambient electronica. More suited to 5am than 5pm but they carried the crowd along just fine and dandy. Blimey. Again. The Enid. Absolutely stunning. An ‘old’ band with young heads. Godfrey still leads the line but the young supporting cast, epitomised by the mesmerising frontman Joe Payne, time shifts the band firmly into the 21st century. The young bloods have managed the trick of expanding the bands legacy of sweeping orchestral, almost operatic, velvet soundscapes into truly relevant avant garde performance. Lyrically and musically they simply push at contemporary boundaries. They are now officially Timeless! A couple of old classics in the set list to satisfy the faithful would not have come amiss – but minor hassle in a majestic set. Focus followed the Caravan tradition with a rock solid hour of top notch classics. A great set and excellent musicians with bassist Bobby Jacobs in particularly fine form. Ian Anderson played Tull wall-to-wall classics from opener Living In The Past to closing number Locomotive Breath. Musically Anderson and the band were excellent with some hugely entertaining theatrical flautist antics from the great man. On the night however, the vocals sounded decidedly iffy throughout the set and it marred an otherwise fine performance for this reviewer. Let’s hope it’s a one-off. It was down to the Von Hertzen Bros to close the whole Prog shebang. They were excellent in delivering an accomplished and varied set to leave the place bouncing. Finland’s finest really are very very good and a splendid live band. Their variety is perhaps both a strength and a weakness – a little more honing and focus on their distinctive elements would turn a excellent band into something special indeed. Still work in progress but eh, they were a cracking and worthy band to finish a great day of Prog. So… There you go. HRH Prog / Sci-fi Weekender 2016 managed to top the excellent 2015 bash – which is some achievement. A fabulous weekend with great people, splendid entertainment, and one lasting memory which is now etched indelibly on FFA’s cerebral cortex – GORDON’S ALIVE!!! !